Vishay UltraViolet LEDs, available now from Mouser, are a family of UV LEDs with mid to high radiant power range. These LEDs offer silicone lenses that provide a particularly long lifetime. The UV LEDs provide 265nm to 410nm dominant wavelength range. These LEDs run from 3.2V to 16V forward voltage range. The devices come in compact surface mount packages and are compatible with reflow soldering processes. 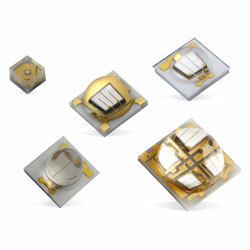 These LEDs aids 25000hrs of lifecycle with low power consumption. The devices derive their application in UV curing, counterfeit currency detection, blood detection, and photocatalytic purification. These LEDs are an energy-saving replacement for mercury lamps. Other UV curing applications include nail salons, dental and printing areas.